T-Mobile fared pretty well in OpenSignal’s State of Mobile Networks: USA report earlier this year, and it looks like T-Mo has done well in the second report of 2016, too. 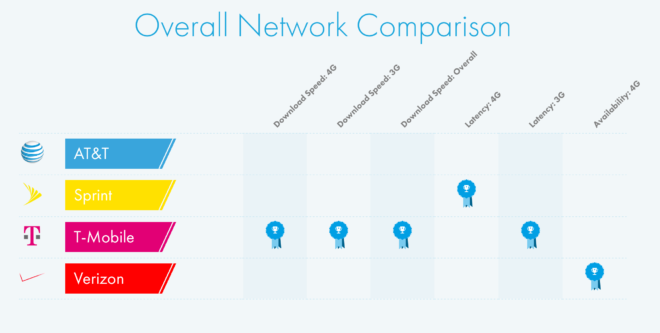 OpenSignal today released its latest State of Mobile Networks: USA report, and in it, T-Mobile came away with the fastest 4G LTE and 3G network speeds. T-Mo’s average LTE download speed was 16.28Mbps, while Verizon’s was 15.94Mbps. Meanwhile, AT&T posted an average LTE download speed of 12.83Mbps, while Sprint’s was 9.36Mbps. T-Mobile also won an award for fastest overall download speed, which factors in LTE and 3G speeds as well as the availability of each network technology. Two areas that T-Mobile conceded to its competitors were 4G LTE network availability and 4G LTE network latency, which went to Verizon and Sprint, respectively. T-Mo did come in second in both categories, though it did win out for 3G network latency. In the overall network comparison, T-Mobile finished with four category wins, while Sprint and Verizon each had one and AT&T finished with zero. OpenSignal says that for this report, it examined 2,818,124,916 datapoints from 120,586 users of the OpenSignal app. The data was collected between May 1 and July 10, 2016. In its conclusion, OpenSignal points to T-Mobile’s efforts to build out LTE coverage in rural areas and its rollout of 700MHz spectrum as reasons for its wins. T-Mobile has placed a heavy focus on rolling out 700MHz coverage, also known as Extended Range LTE, and it plans to continue to do so. 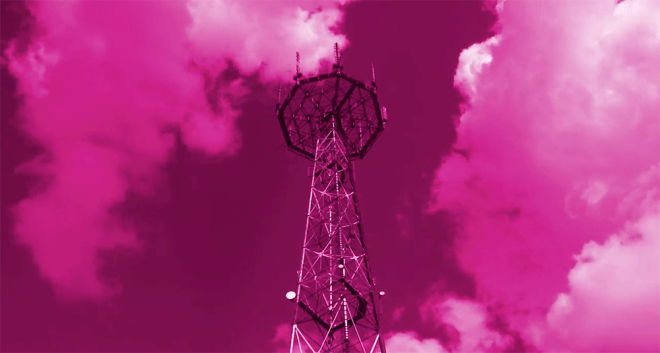 T-Mo recently revealed that its entered into agreements to acquire 700MHz A-Block spectrum in cities like Chicago, Nashville, Salt Lake City, and Columbus, and that it also plans to roll out additional 700MHz sites in cities like San Francisco, Phoenix, San Diego, and Las Vegas. To view the full OpenSignal report, hit up the link below. Woo-hoo Tmobile! Bring on Nashville 700Mhz. Area available for network deployment since August 2016. Spectrum Gateway expects band 12 network to be deployed in Q4/2016 – Q1/2017. Do you have quickdraw on the Columbus OH rollout? Salt Lake City just got the same status update on 700 mhz, and Legere specifically mentioned SLC in the last earnings call. Should be nice for rural expansion! T Mobile USA’s work is starting to pay off. They still have a long way to go since they are eventually going to have to build or lease towers to improve the signals in the new areas that their low band spectrum covers. I don’t think Tmo own ANY towers anymore… At least, they sold a bunch a few years ago to a company that manages towers. I could be wrong, though. Have ALL 2G Edge cell towers been upgraded to LTE? Once that happens then you can brag about your network t-mobile, but not until then. no, because the 2G technology is still being used by legacy devices for voice calls which is about 40% of the total calls. So until then they have nothing to brag about? Okay, good to know. Glad we have you. LOL, what an envious comment. No need to be jealous, just cut the other guy and join us. You’ll probably pay less for more, especially if you travel. T-Mobile can’t be beat when you travel outside the US. T-Mobile has enough mid-frequency spectrum to have better speeds in many places, but they prefer the to have the POP numbers almost as good as Verizon’s with the 5×5 700mhz; Just don’t talk about miles of coverage. No, in fact T-mobile has a way of making the 2G cells joint 2G-3G. They need to keep the 2G because there are many business applications, like vending machines, that only use 2G and with AT&T exiting that market next year, T-Mobile will be the only provider for these services. T-Mobile really is one of the big players now. VZW and AT&T don’t want to admit it yet, and some consumers still have a bias against T-Mo due to the struggling years of the carrier, but report after report, quarter after quarter, T-Mobile proves that with the right leadership any ship can be pointed and taken in the right direction. Less than 5 years ago T-Mobile could have arguably had the worst coverage, lame devices, and indecisive leadership. Now people flock to them and they often have some of the strongest signals around me.. But I’ll let the awards speak for themselves. John Legere for POTUS, anyone? Legere is a much better guy than Trump. Loose cannon, maybe, but not with the same views or thoughts. Legere reminds me more of “The crazy ones..” quote by Rob Siltanen from that Apple commercial. Sometimes different is exactly what’s needed. This survey measures by number of people using the app, not square miles. And I’m pretty sure you can only use the app where you have coverage. Flawed test. You all might be right about T-Mobile not having the coverage – but Having been with T-mobile for 6 years now, I can tell you that the coverage has improved tremendously since I started using T-Mobile, with notable improvement in the last two years. No they are not Verizon yet, but they are definitely usable. Folks might want to get a new phone though, with all the frequency additions T-Mobile has made, using a 3 – 4 year old phone won’t get you any of the new service. 1000% agreed as I have been a T-Mobile customer for 14 years and seen the improvements. HAHAHAHAHA!!! “Unlimited” data! Better check your find print again, troll. Maybe ask for more money to troll us. Why don’t you get off yours. You’re the on who came here to down play T-Mobile’s success. I had At&t and it was absolutely unbearable how they make you pay for everything. Unless you actually utilize traveling all over and I mean all over the place your argument is invalid and idiotic. You pay 50% more for “coverage” that you most likely never even use. And that pizza was awsome, so was my free hat from mlb.com, my 5 free tickets to suicide squade, 5 tickets to Bush and Chevelle concert, free lift rides. And thats just in the last 5 weeks. Each line on the account gets the offer. Its unfortunate that Dominoes couldn’t handle the surge in pizza orders, but answet this… What has AT&T given you? If you do the math on what TMo has given me so far you’re looking at 5 pizzas @ $10 each= $50. 5 x $20 mlb.com = 100. 5 x 13 for suicide squad = $65. 5 x $20 for concert tix = $100 thats $315 so far in 5 weeks. My bill for 5 lines isn’t even f315 per month. Lets not forget my free shares. So far i have collected 18 for 9 referrals (I get 2 per account since ive been a customer for 5 years.) 18 shares x $41 per share = $738. Sounds like TMo is paying me buddy. When you finally decide to not be a sheep any longer dm me and I’ll send you a referral code lol. I travel all over…5 years ago it was difficult not to carry a prepaid burner when traveling. Today it’s just not the case. Hmm, I have the 6 gig family plan and only pay 136 with tax for four lines. The 5th line would make it $160. You might want to check your plan if you are paying anything close to $315 a month. Yeah, we got the MLB – that is actually $119 per phone value. Interesting with Tmobile, they don’t charge for most of the data, videos, no charge, music, no charge, Pokemon no charge – so I have no way of blowing through 6 gigs of data, unless I do tons of work on the road, and use the Free hotspot/tethering capability of my phone. I’m a cross country trucker so yes coverage is important to me. And read the bottom of my post again. I have cricket wireless which uses ATT towers. Truly unlimited data $65 total! on all day and night, yes T-Mobile doesn’t have the reach…yet! near big cities, makes sense to hit those places up first, then branch out to the rural areas. Im a trucker so i need coverage over speed. You know as i do that 8 mbps is fast enough to stream netflix and do what ever you would need to on the web. Plus Im on a truly unlimited plan and just used 72gb last month!